I am convinced that one day humans are going to evolve into large blobs of cerebral matter encased in sallow skin with a texture like tripe, where all means of self propulsion have been lost through neglect. They will be totally reliant upon mechanical locomotion. "Rumination genes" will become dominant, and "common sense detector genes" recessive, while all of our accumulated artisan and practical physical skills will be lost forever. The early signs are evident. Our world is increasingly populated by philosophers, cogitators and theorists who would not know a grommet from a gimlet, or be able to identify a wigwam for a goose's bridle even if it came up in broad daylight with sirens blaring and bit them on the arse five times in a row. Furthermore, many of those with all the brains are wasting their lives by concentrating on minutiae. I, of course, have an example for you, just to annoy any critics who might like to suggest that I write nothing but unsubstantiated rubbish. "Longitudinal Cohort Study of the displacement of teaspoons in an Australian research Institute"
Motivated by the regular disappearance of teaspoons from the tearooms in this boffin sanctuary, the erudite trio wasted somebody's money determining eventually (with a statistical significance P=0.88) that indeed 80% of teaspoons disappeared from the tearooms during the trial period. Spoon replacement cost; $A100 per year. So what practical recommendations or solutions did this educated-beyond-their-intelligence lot come up with? "Development of effective control measures against the loss of teaspoons should be a priority." Now this piece of academic drivel was published in the highly respected British Medical Journal, (whose motto incidentally is; "helping doctors make better decisions") and presumably doctors all around the world made the stupid decisions to read it when they could have been doing something useful…like treating patients. So, for the benefit of the three geniuses who were bereft of practical solutions, please allow GOF, the intellectual mouse, to help you out. with short lengths of towing chain welded to the spoon handles. 2. Superglue the spoons into the ends of 6 foot long broomsticks. teaspoons tucked between her legs. Shop, then further disfigure them with my 12 inch fencing pliers. fancy-pants $100 a year cutlery. 4. Compulsory strip searches for all staff leaving the tearooms. Sheesh! Why do I bother. Now, in what nook of our cave did Mrs GOF hide my spears this week. I'm going out on a very long trek to see if I can catch me a hairy mammoth for dinner. Posted in Uncategorized and tagged research, science. Bookmark the permalink. This year is turning out to be an annus horribilis for my swine friends. "Feral pigs are destroying the Reef." Previously in The Bucket we have discussed various odd associations like cows with guns, and chickens in choppers, so why not now scuba diving suicide piglets with coral destroying bombs strapped to their little bellies. The article was however referring to the incumbent government's inept management of feral pigs rooting around in mainland national parks, the catchment areas from which runoff ends up in the Coral Sea. Dirty fresh water is apparently detrimental to coral growth on the Great Barrier Reef. Over my lifetime I have witnessed numerous prophets of doom proclaiming the imminent demise of our coral reefs. Depending upon which attention-seeking post graduate nerd was positioning him/herself in front of a microphone or television camera at the time, various causes were espoused. Crown of thorns starfish, excess sediment from rivers, too much fresh water, acid rain, nutrient and effluent from cities, farm chemical and fertiliser residues, acid sulphate soils, and coral bleaching from increased sea water temperature. It's a wonder there is any reef left at all. Several of these variables have been impacting upon the reef in natural cycles for thousands of years. Nature responds, and accommodates change. To a degree…..it is the extent of that degree which humans still do not fully understand. The following contribution may very well not add to that understanding. I live at the business end of the feral pigs habitat and see the damage they do to the rainforest floor in the mountains, which doubtless results in some increased sediment runoff, some of which may end up on the coastal flood plain. Finer particles might just reach the sea where river outflows are then mostly driven parallel to the coast by ocean currents. Given that the barrier reef is, on average, between 50 and 100 kilometers offshore over its 1200 mile length, I wish to postulate my own theory on "how much damage feral pigs do to the Great Barrier Reef". Firstly I would like to introduce to you a very old Australian bushmans unit of measurement which has sadly gone out of vogue with the advent of political correctness. I wish to resurrect it. It is called a "poofteenth". It has a value somewhere between zero and three eighths of bugger-all. The damage that feral pigs cause to the Great Barrier Reef is coincidentally and precisely one single poofteenth. So, aspiring young environmentalists of the world, go to it, prove me wrong. I am a conservationist at heart, and, as a student of the natural world have an awareness of the constant need to monitor our environment and act appropriately in response. It is my contention that far too much "research" is conducted primarily for the purpose of enhancing personal curricula vitae, rather than being a genuine effort for discovery of the real truth. We would be better served when making practical decisions, to rely upon wiser heads with a broader intellectual and historical understanding of the evolution of our planet. Posted in Uncategorized and tagged barrier reef, pigs, research. Bookmark the permalink. L = Y and R = X ? The human knowledge base deserves our appreciation of all the research work previously done by students, academics and scientists from all around the world. Many scientific discoveries eventually find practical purposes in our daily lives. Some, however, either never quite make the grade, or indeed go on to conclude the bleeding obvious. A recent study of dementia patients found that if they did a lot of walking, then, on average, their cognisance skills improved significantly . Before being impressed by such findings I would need to know just how many patients they got back, and how many are still on the loose. Sugar cane is a crop which is harvested annually…..stalks cut off at ground level, and allowed to shoot again to provide a ratoon crop for harvesting in the following year. For reasons known only to themselves, agricultural scientists found it necessary to evaluate whether driving heavy harvesting tractors on top of the cut plants, instead of, as common sense and normal practice would dictate between the rows, would effect the regrowth of the cane. In effect to determine whether severely trampled cane would regrow at the same rate as kindly nurtured cane. They eventually proudly announced results which any kindergarten kid could have predicted. No, it does not regrow all that well at all. 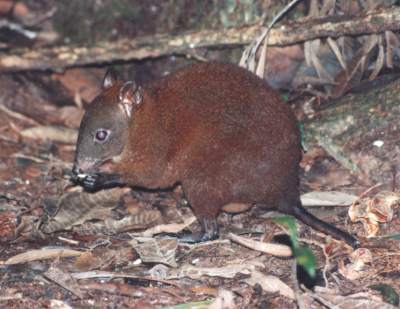 I have witnessed highly paid animal behaviourists spending years lurking daily in tropical rainforest adjacent to GOF's paradise, humanely trapping and tying cotton thread onto the tails of musky rat kangaroos (guinea-pig size Australian marsupial) before letting them go again. The following day, the intelligentsia come back to map exactly where the critters had travelled during the night by tracking the trail of thread unwound from the reel. Now I could have told them where they went without going to all that trouble. Where do you think they are going to go when some persistent intruder keeps tying ropes on their arses. They went further into the rainforest you bloody twits, to get away from you, and all your molesting, as no doubt your useless never-ever-to-see-the-light-of-day thesis will expound. Some research is just plain stupid. GOF, on the other hand would like to conduct the final phase of a scientific experiment begun 17 years ago, which will revolutionise our conventional understanding of genetics. 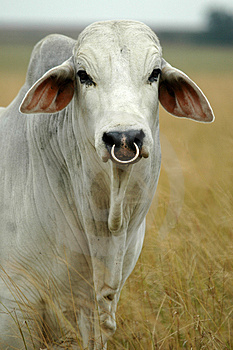 My neighbour once owned a very large Brahman bull. I had a small number of cows of more dubious and indistinguished parentage. I think the bull loved my cows. That is understandable, for my cows were very attractive cows in a bovine sense. The bull loved them all so very much that the barbed wire fence between our two properties provided no impediment to his passion. Over the years, on both sides of the fence, he sired 12 progeny, all of which were bull calves. No heifers. Mr Brahman Bull only had a single left testicle. Now, in order to complete my research, if its not too much trouble, could I please impose upon one of my loyal vox readers to lend me one of your bulls possessing only a single testicle of the right hand persuasion, so that I will be able to conclusively prove beyond any reasonable doubt that the left one always contains only Y chromosome bearing sperm, whilst the right one is full of little X's. Such a finding could have widespread repercussions for human family planning. It will eliminate all that lengthy and noisy messing around in the bedroom with grandma's advice on the correct way to conceive either a boy or girl child. One little snip, and the choice is yours. GOF will happily share all the forthcoming fame, accolades and money with the donor of our testicularly deficient bull. I will personally launch a worldwide surgical crusade. There is a huge market out there to help all those men and cultures whose reproductive policy is predicated on the fundamental belief that boy children are superior to girls. My hand is, however, occasionally, a little unsteady, and I have in the past been known to show a devotion to duty somewhat beyond my original job description. Now gentlemen, who would like to be first? Get in before the rush. Do they have a Nobel Prize for genetics so I can put it on my mantelpiece already cluttered with those I got for peace and literature? Posted in Uncategorized and tagged bulls, nonsense, research, science. Bookmark the permalink.